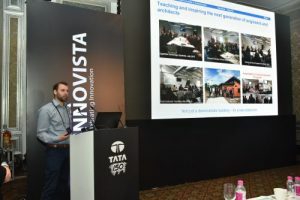 The Active Classroom by Swansea University made the finals of the prestigious Tata Group InnoVista Awards in Mumbai, India, in May 2018. The event is an annual internal Tata Group Innovation award ceremony attracting entries from across the group including Tata Steel, Tata Chemicals and Jaguar Land Rover. 100 entries are chosen from 3,000 entries across the globe in regional finals to compete in a range of categories. The Classroom was entered into the Design Honours and Open Innovation categories, focusing on how all of the technologies incorporated in the building were brought together for the first time to demonstrate what can be achieved. The Active Classroom came runner up to an entry from Jaguar Land Rover – but it’s a great achievement just getting to the finals! Since then the Active Classroom has won a number of local awards in the U.K, including Royal Institute of Chartered Surveyors (RICS) Wales – Design Through Innovation Award. And a Swansea University Innovation Collaborators award – taking the number of awards the building has won to about 7. A new promotional video for the Active Buildings program can be seen here.